The latest Hayao Miyazaki film from Studio Ghibli is as sweet and wonderful as the others, and Blu-ray does a beautiful job of showcasing the animation. From Ponyo’s red hair to the colorful beads of Ponyo’s magical undersea mother, every detail is bright. The audio is clear too, with the sounds of crashing waves booming out of the speakers. 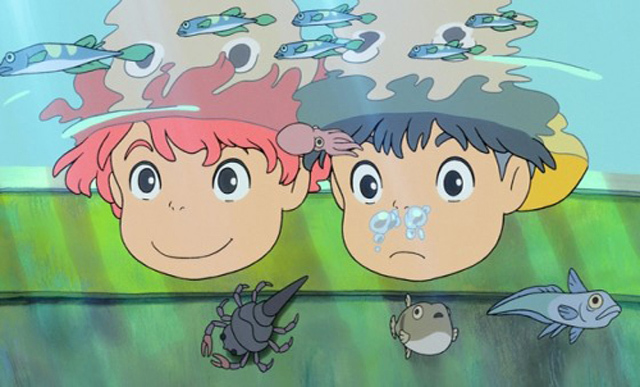 Inspired by Hans Christian Andersen’s The Little Mermaid, Ponyo tells the story of a little fish who wants desperately to become a human when she meets a little boy. This English-language version of the Japanese animation features well-known voices, including Cate Blanchett (Robin Hood), Tina Fey (Megamind), Matt Damon (Green Zone), Liam Neeson (Unknown), Cloris Leachman (TV’s Raising Hope), Betty White (TV’s Hot in Cleveland) and Lily Tomlin (TV’s Damages). The kids, Ponyo and her friend Sosuke, are played by younger siblings of well-known stars: Noah Lindsey Cyrus (Miley’s sister) and Frankie Jonas (another Jonas brother). In one of the many featurettes on the disc, Miyazaki says Ponyo is a film for 5-year-olds, but the Blu-ray extras are most definitely for adults. The “Behind the Studio” section offers a bunch of featurettes, but they’re mostly in Japanese with subtitles. They are interesting nontheless for adult fans of Miyazaki’s work, but this is why I gave the overal package four dishes instead of five. The only English-language featurettes are an intro and a featurette about the voice cast, in which a very grownup Frankie informs us that Ponyo has a different “vibe” than Miyazaki’s other work, and he likes that. Also on the Blu-ray is a section called “The World of Ghibli,” of which just the menu provides lots of entertainment. Users can click on the different areas of an island filled with Ghibli’s characters to learn more about each film. It’s promotional, yes, but it’s also a fun introduction to Miyazaki’s work for viewers who have only seen Ponyo. Animation fans also will get a kick out of being able to watch the movie side by side with the original storyboards, another Blu-ray feature. I totally agree. The sound and picture quality were amazing on the blueray. What a wonderful upbeat story and great characters too. Yeah, it’s a sweet movie, and beautiful on Blu-ray. I’m very excited to see this movie which I heard was the last for Miyazaki. I’ve enjoyed his past work immensely. Great themes, wonderful artistry and storytelling. It’s almost like a playground for the imagination. Once I see it I will revisit the site and post my thoughts on this movie. Yeah, Kat. You’re right. It is like a playground for the imagination. He has a great visual style. You’ll love the image of Ponyo’s mother. Looking forward to seeing your thoughts.